The median equity stake of US venture-backed post-Series A CEO has increased from 15% to 21%, a 40% increase in five years. This trend is also manifested in Series Bs, but as the chart above shows, post-Series C and D, total founder/CEO equity positions have remained constant. Meanwhile the equity stakes of founding VP of Engineering and VP of Product have remained relatively constant throughout the same five year period across all stages of company. Founder stakes start high and then typically decrease over time as founding teams sell equity stakes in their company in exchange for venture capital investment and also granting shares to hire candidates and retain existing employees. As valuations have increased in Series A companies, founders may be able to sell less of their company in order to raise the same amount of money. Of course, investors do tend to have ownership thresholds, which constrains this trend to some extent. But valuation expansion isn’t the most important trend driving this rise in founder-CEO equity stakes. If it were, VPE and VPP equity stakes would also see a relative rise over time, because each of the three is a founder and the reduction in dilution would benefit each proportionately. 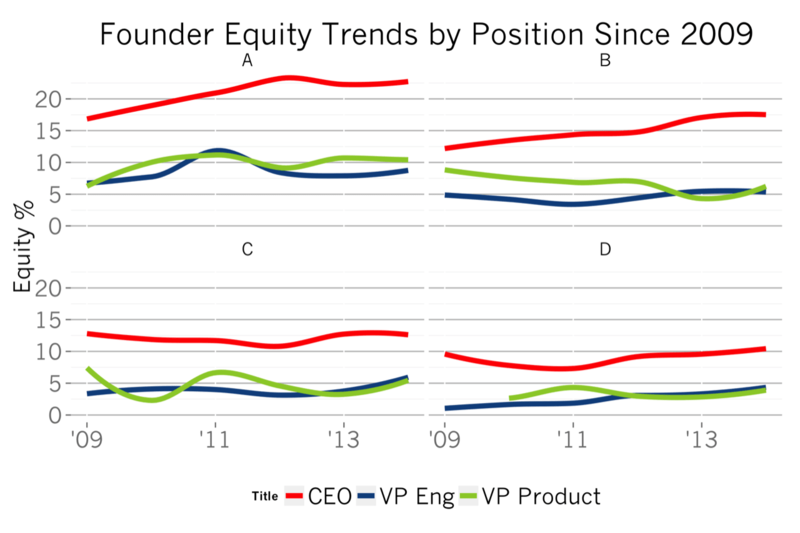 Instead, I suspect the data is showing a rise in the number of single founder companies, because CEO stakes are increasing but the equity positions of VPP and VPE haven’t risen in tandem. Aside from valuation, the major determinant of a founder/CEO’s equity stake is the number of founders in the company. The fewer the number of founders, the greater the equity stakes for each founder. There is some subset of companies within the data which only have a founding CEO. Another cohort has a founding CEO and VPE. Another group has a founding CEO, VPE, VPP and so on. All those cohorts are mixed in the chart and the data I use doesn’t specify the number of founders within the company. I don’t know of any data, anecdotal or quantitative, that shows success rate is correlated to number of founders, and I wouldn’t believe such an argument. Redpoint has invested in companies with a solo founders, a duo of founders and a trio founders. We’ve seen success with all these types of founding teams. Rather, this increase in single-founder startups is likely a by-product of the growth in entrepreneurship in the US. Individuals, enamored with an idea, take it upon themselves to start a company to create the change they wish to see in the world. And that’s a very good thing.